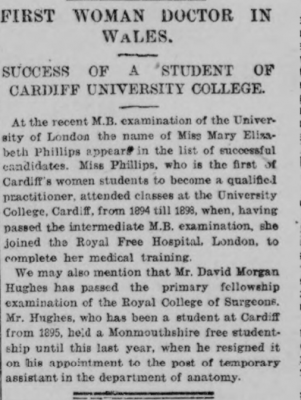 For the second instalment of our “Inspirational People” series, we are looking back at the first female graduate of the Medical School in Cardiff. In the years following her studies, Mary “Eppynt” Phillips went on to live an undoubtedly inspirational life, making a remarkable contribution to medicine during and after the First World War. In the 1890s, women’s entry into the medical profession was, at best, challenging. Having medical doctors who were women was a relatively recent advancement in Britain. At the time, only a handful of British medical schools would admit women students to their courses. 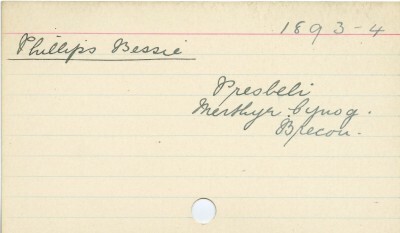 Entry for “Bessie Phillips” in the Matriculation Book, 1883-1895 [Ref. UCC/R/Stu/Mat/1]. 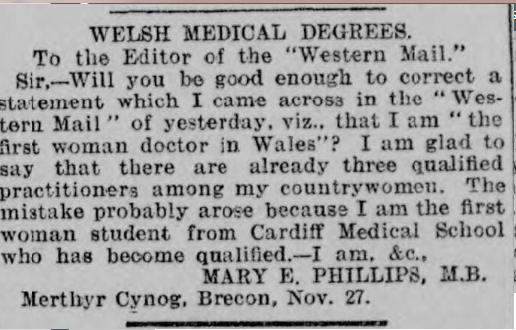 She was noted by the Western Mail as being the first female doctor in Wales, but she disputed this herself in a letter to the Western Mail (see excerpts reproduced below). 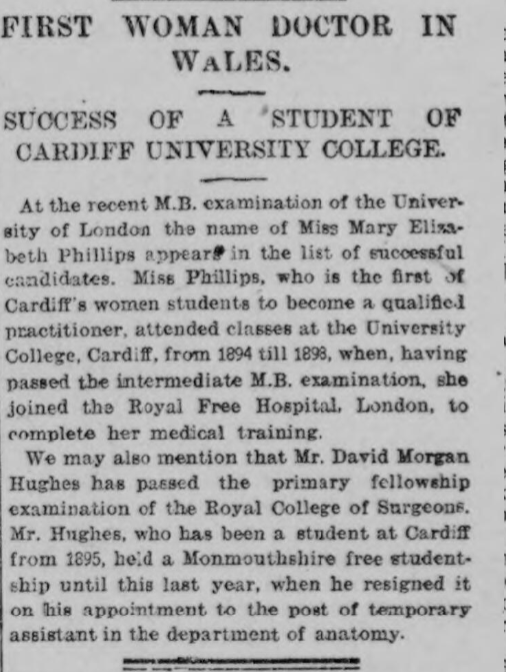 There is no doubt that as a qualified medical doctor, Mary “Eppynt” Phillips made a huge contribution to medicine, both in the UK and abroad. Information gathered from newspaper reports reveal that in the first year of the First World War she travelled with another female doctor to Calais to establish a typhoid hospital under the auspices of the Scottish Women’s Hospital. The Scottish Women’s Hospital was a movement set up to provide opportunities for women doctors and nurses to provide medical assistance all over Europe. In April 1915 she set sail for Serbia. En route to Serbia, however, she was instructed by Lord Methuen, the Lieutenant-General, to divert her journey in order to attend to those wounded in the Dardanelles campaign. Following this diversion, she progressed to Serbia where she became the senior physician of the Scottish Women’s Hospital operation. After a period of convalescence in Britain (during which she gave a series of lectures raising awareness and funds for the Scottish Women’s Hospital’s war work), she travelled to Corsica where she worked with female refugees from Serbia. The places she worked during this period can be found in her CV, which is available on the People’s Collection website. A report in the Brecon Radnor Express, 19 July 1917, describes her as “one of the foremost women doctors in her record of war work, of which Wales generally, and Merthyr Cynog […] in particular, may, indeed, be proud”. 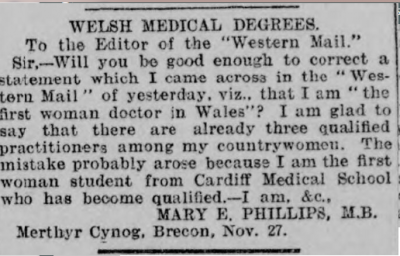 Mary “Eppynt” Phillips’ extensive involvement in the medical side of the war effort is remarkable, and her work with refugees is both topical and inspiring. She used the skills learned from her education in Cardiff to help those most in need and, as such, Cardiff University too should feel a sense of pride in the truly inspirational work of its first female medical graduate. If you’re interested in learning more about Mary “Eppynt” Phillips, you can view a collection of primary sources at https://www.peoplescollection.wales/collections/430174.